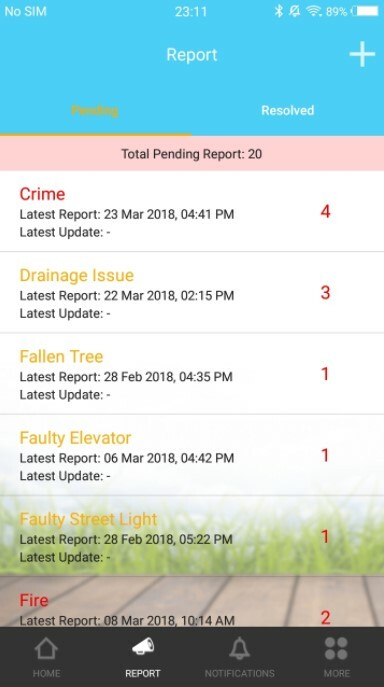 Incident Report is a feature in i-Neighbour that allows both the Management and Residents of a neighbourhood to report any accidents via Web or Mobile App that occured within the compound. This is to allow the personnel in charge to rectify the issues as soon as possible. 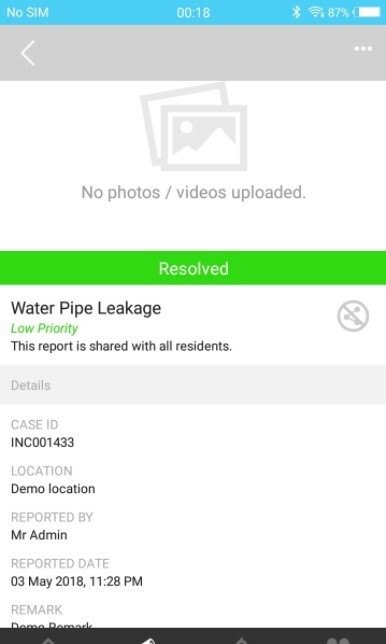 To proceed to the Incident Report Overview, please login to your Admin account at www.i-neighbour.com > REPORT > Incident Report. 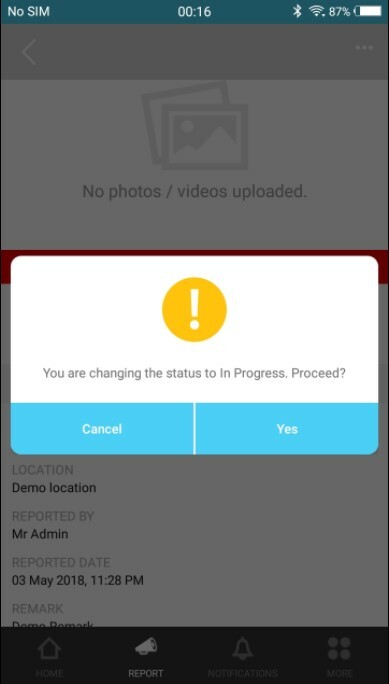 In the Overview, Admins will be able to access functions such as Setup Report, Create Report, View Report, Edit/Update Report, Print Report. 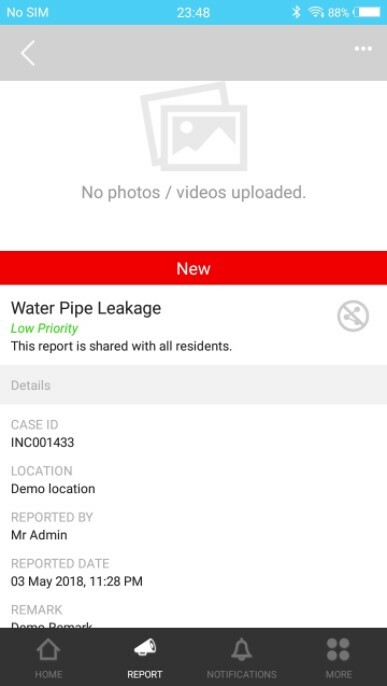 To proceed to the Incident Report Overview, please login to your Admin account in i-Neighbour App and tap on REPORT under the Homepage or at MORE > Report. In the overview, Admins will be able to access functions such as View Reports, Create Report and Edit /Update Report. 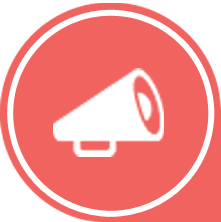 Before a report can be added by the Admins or Residents, the report must first be setup beforehand. (This action can only carried out in the Web Portal of i-Neighbour.) 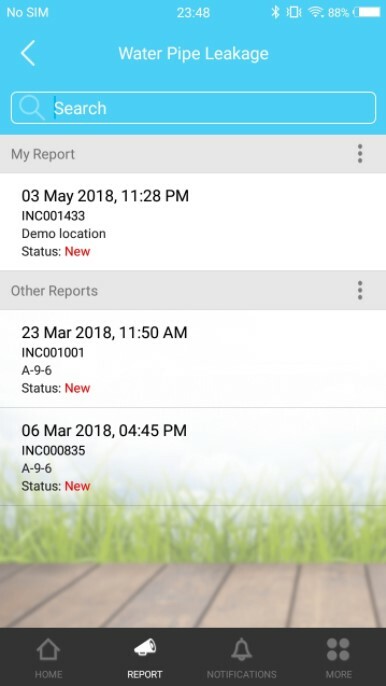 Hence, to setup a report in i-Neighbour, please proceed to the Incident Report Overview and click on the Settings Icon beside the Create Report button. 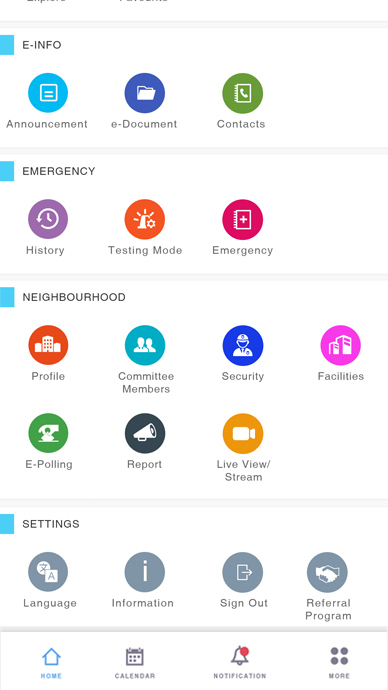 Once done, you will be taken to the setup page whereby you can create a list of incidents that might occur within your neighbourhood such as Crime, Defect, Vandalism and etc. Click on the Add button and proceed to type the Name and Priority Level of the incident. Lastly, click on the Save Icon to confirm your action. 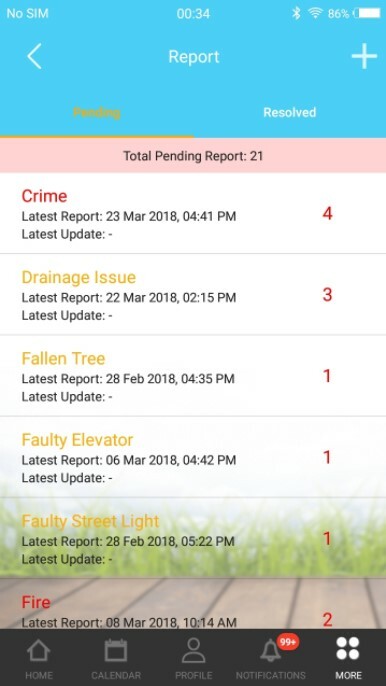 After listing out all of the possible incidents that could occur within your neighbourhood, please click on the Report Recipient Tab to include the personnel in charge of the various incidents in terms of the Priority Level (High, Medium, Low). To place the relevant personnel into the listed Priority Level, please click on the Edit Icon and a pop-up form will be displayed for you to include the individuals. Once done, click on the Save button to confirm the action. To create a report, please click on the CREATE REPORT button in the Incident Report Overview. Next, a form will be displayed for you to fill up the necessary fields. Once completed, click CREATE to report the incident. A pop-up will appear to confirm the action. To create a report, please click on the + button in the Incident Report Overview. Next, a form will be displayed for you to fill up the necessary fields. Once completed, click Submit to report the incident. A pop-up will appear to confirm the action. To edit/update a report, please proceed to the Incident Report Overview at REPORT > Incident Report. Once at the overview, click on the report folder and subsequently, the report that you wish to edit/update. You will then be taken to the Report’s Details page whereby you can Edit/Update the report. To Edit the report, click on the Edit Icon on the top right of the Details column to start the editing process. If the report has been shared with the neighbourhood, the Admins will then be allowed to Depublish or Publish the report, if necessary. 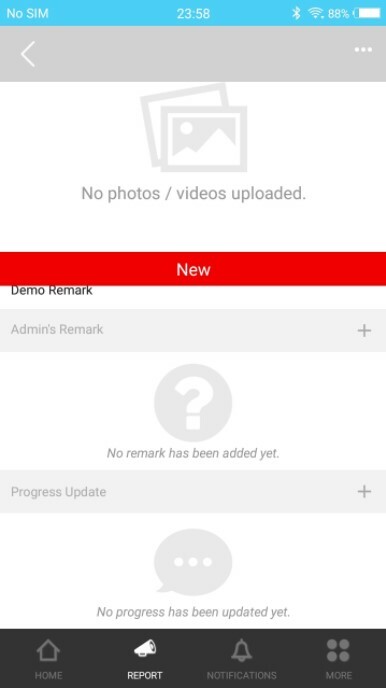 On Default, the report will list: Mark as In-Progress and Mark as Resolved for the Admins to notify the residents regarding the status of the report. However, depending on the status of the report, the options listed might differ. 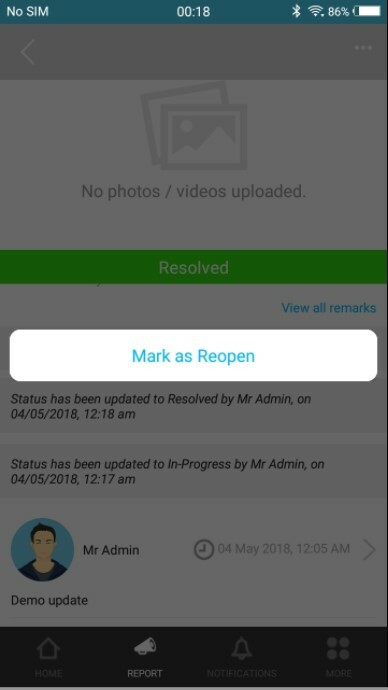 If the report is marked as resolved, the Re-Open Case option will be listed instead for the Admins. 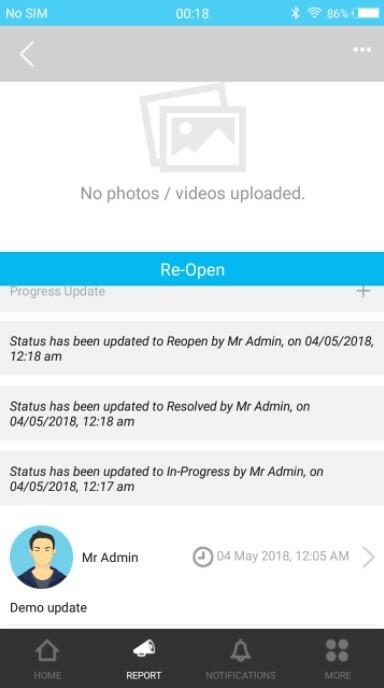 The Progress Update column will display the status update whenever the Admins update the report, i.e. Mark as In-Progress and etc. Note that Admins can also add their own update by clicking on the + Icon located at the top right of the column. To edit/update a report, please proceed to the Incident Report Overview at REPORT or MORE > Report. 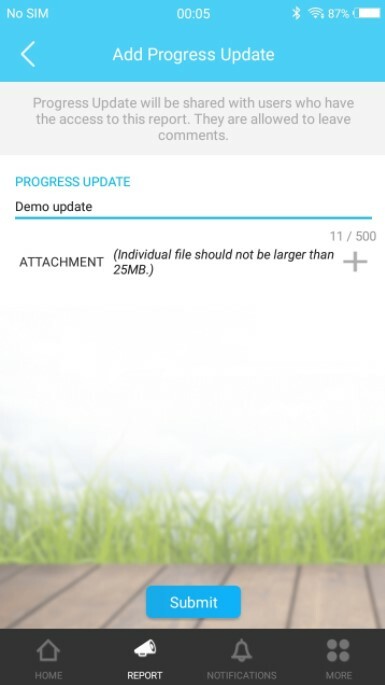 Next, tap on the Report folder and subsequently the report that you wish to edit/update. 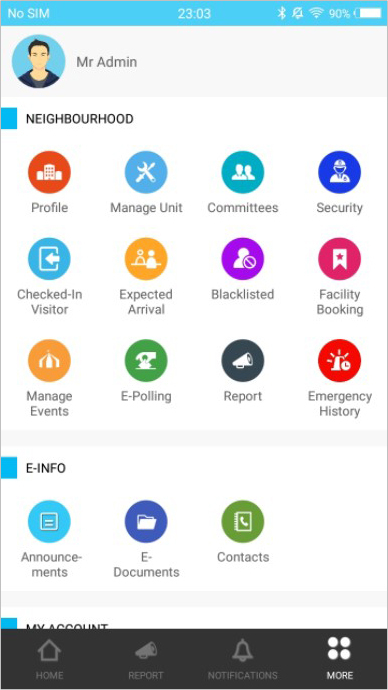 Once in the Report Details Page, tap on the More Icon at the top right of the page and Edit to start the editing process. 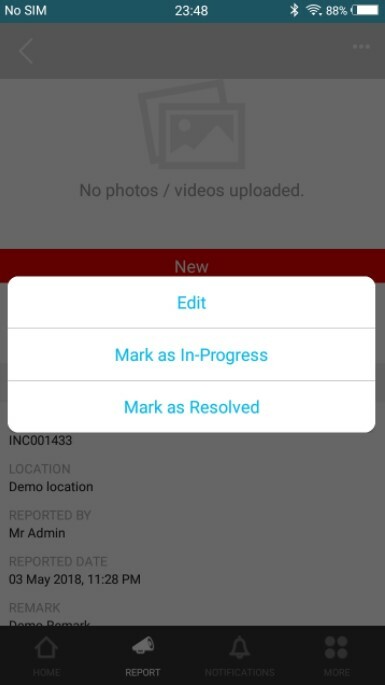 On Default, the list of option included will be Edit, Mark as In-Progress and Mark as Resolved. However, depending on the status of the report, the options listed might differ. If the report is marked as resolved, the Re-Open option will be listed instead for the Admins. 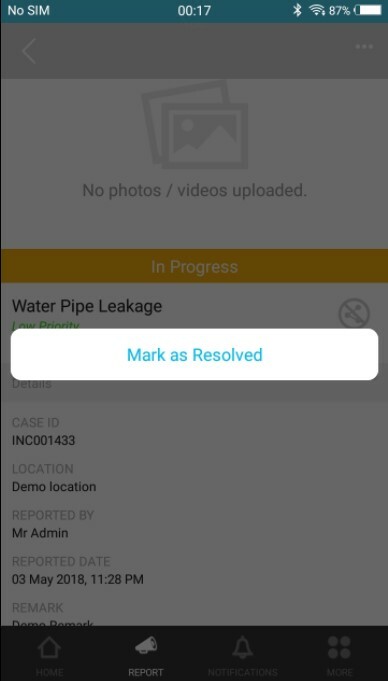 To proceed to the Incident Report Overview, please login to your account at > REPORT > Incident/Defect Report or Incident Report under the Quick Access Column. 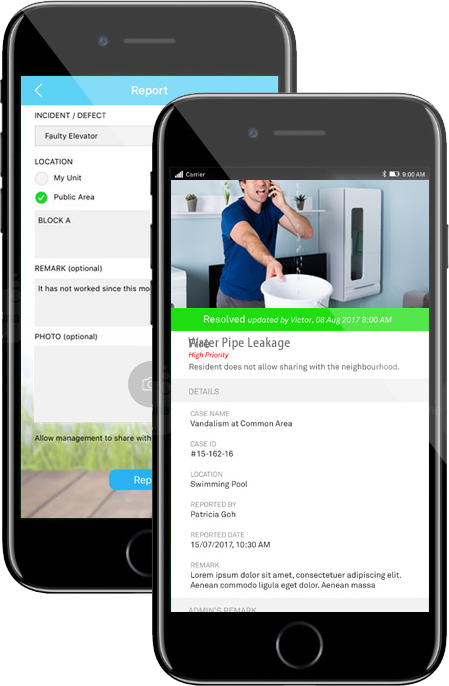 In the Overview, Residents will be able to access functions such as Create Report, View Report, Edit Report and Print Report. To proceed to the Incident Report Overview, please login to your account in i-Neighbour App and tap on REPORT under the Homepage or at MORE > Report. 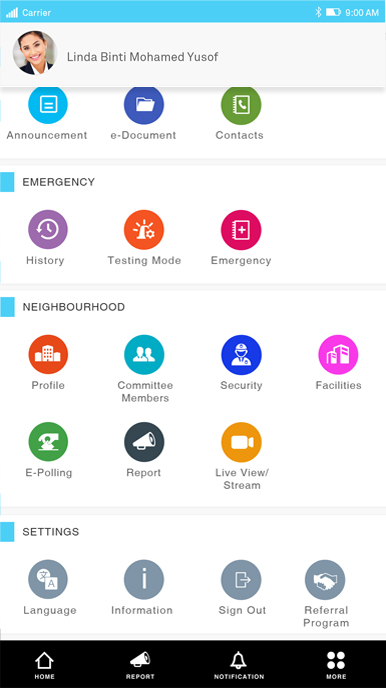 In the Overview, Residents will be able to access functions such as Create Report, View Report and Edit Report. 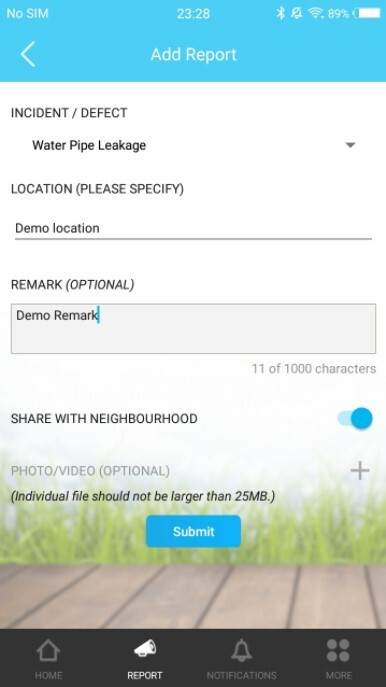 Note that selecting Yes on the ‘Share with neighbourhood’ option will result your report being visible to the residents in your neighbourhood. 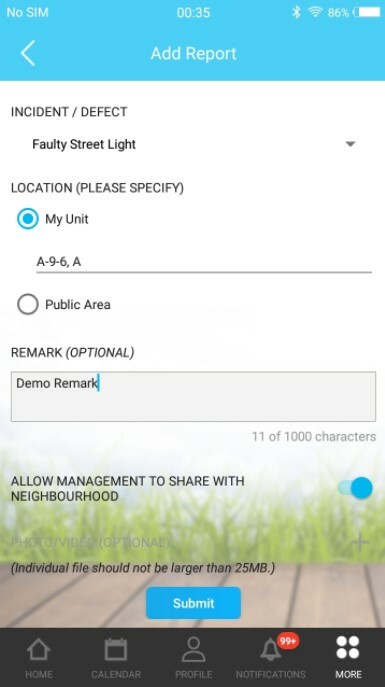 Note that by enabling ‘Allow Management To Share With Neighbourhood’ option will result your report being visible to the residents in your neighbourhood. 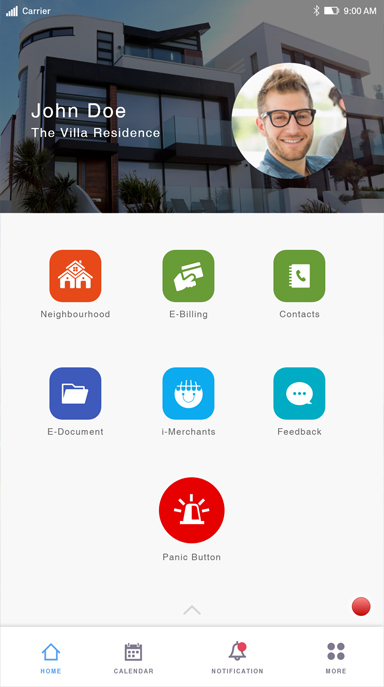 Before proceeding with this step, note that the report can only be edited in the Mobile platform of i-Neighbour. 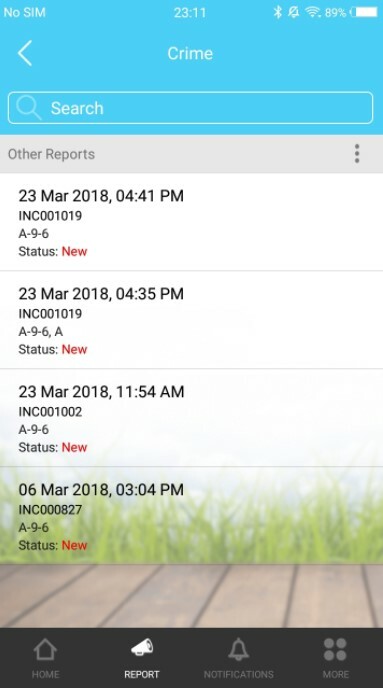 Hence to View the report, please proceed to the Incident Report Overview at REPORT > Incident Report or Incident Report under the Quick Access Column. Once at the overview, click on the report folder and subsequently, the report that you wish to view. You will then be taken to the Report’s Details page whereby you can View the report and its updates. To View/Edit a report, please proceed to the Incident Report Overview at REPORT or MORE > Report. Next, tap on the Report folder and subsequently the report that you wish to View/Edit. Once in the Report’s Details page, please tap on the More icon at the top right to start editing the report. 1. Occasionally, I noticed that I do not have access to the Depublish/Publish function in the report. Is this a glitch in the system? 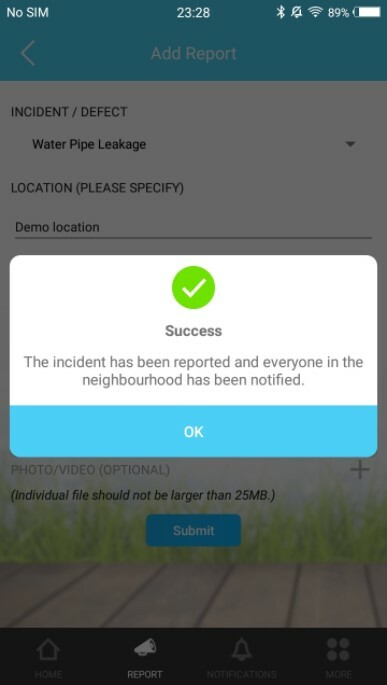 No, if you have no access to this function, this means that the resident who reported the incident did not allow for the report to be shared to the neighbourhood. 2. There are some reports that I do not wish to store anymore in the system. How may I delete the report from the system? For recording purposes, the system do not allow for the report to be deleted. This is to ensure that the Management will always have access to the reports of the neighbourhood. 3. 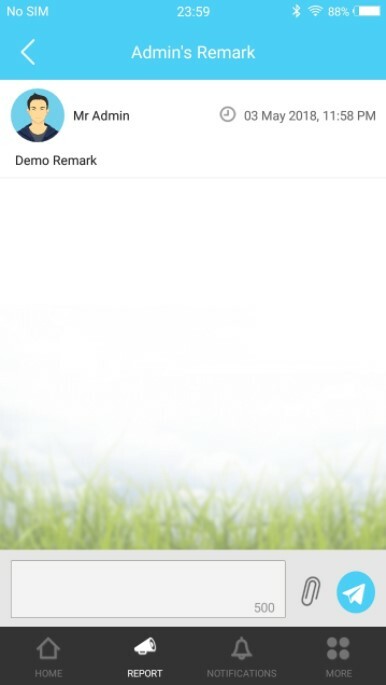 For housekeeping purposes, is there any way that I could store or filter the data that I am presented with in the Report Folder Overview? Yes, you can click on the Filter, Print, Export icons at the top right of the Report Folder Overview in order to store the data properly. 4. I realized that there is a file size limitation for uploading of photo/video into the report, is there any file number limitation imposed? Yes, only a maximum of 5 attachments are allowed in one report. 5. For the Admin Remark function, is there any way that I could allow for the remark to be only visible to certain Admins? No, once the remark is placed, all Admins in the neighbourhood will be able to view the comment included into the report. 1. I noticed that in my Incident Report Overview, there appears to be reports from other residents included as well. Is this what the system intended? 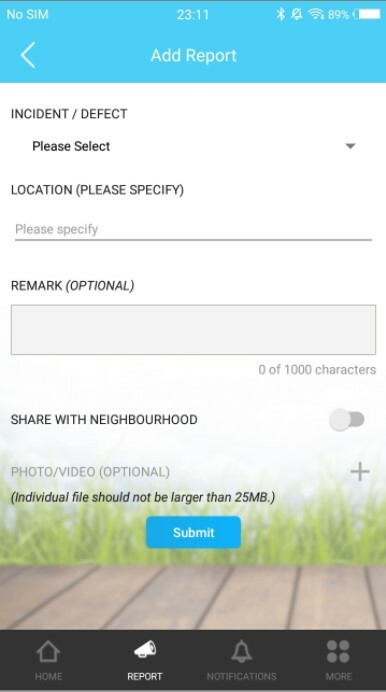 Yes, if other residents have allowed their reports to be shared among the neighbourhood. The report will thus be included in your overview for your reference. 2. 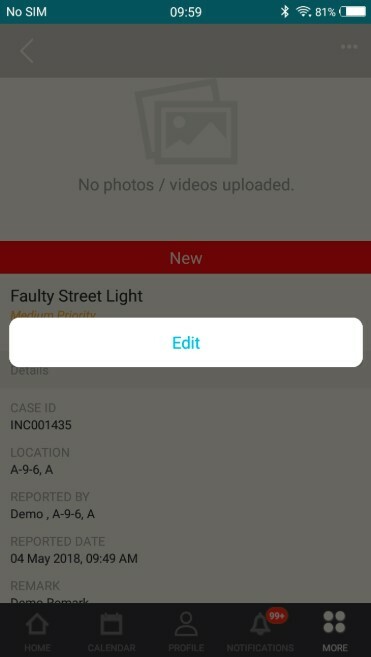 When I share my report to the neighbourhood, will other residents be able to edit/update my report? No, only the Admins will be able to edit/update your report. This is to ensure that only the personnel in charge will be the ones to handle your issues. 3. 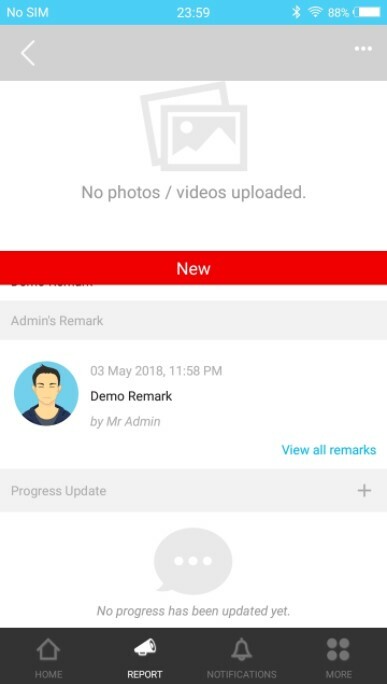 If the Report has been resolved but I realized that there are still some issues, are there any method that I could proceed to inform the Admins to Re-Open the report involved? 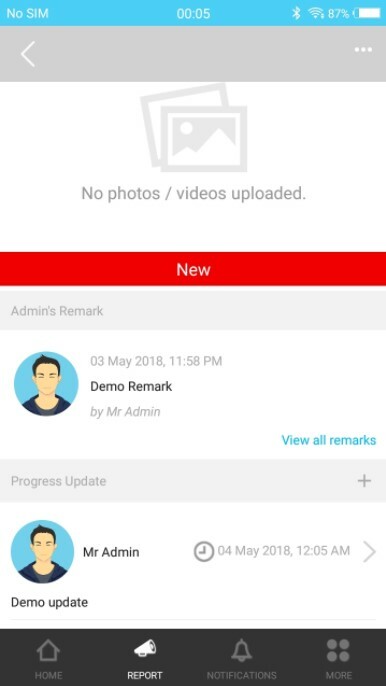 In the report, once the Admins have placed the progress update, residents will then be able to input their comment in the Progress Update column if there are any further issues regarding the matter involved. 4. I want a copy of the report, do I need to proceed to the Management Office in order to obtain it? No, there is no need to head to the Management Office for a copy. To obtain a copy of the report, you will have to login to your account i-Neighbour Web and proceed to click on the Print or Export icon at the top right of the Report’s Details page. Note: If some of the screenshots or steps viewed here are different from the ones in the current system, this is due to our continuous effort to improve our system from time to time. Please notify us at [email protected], we will update it as soon as possible.